Support our troops and show solidarity with the armed forces by hanging a POW/MIA Flag in your school, office or house of worship. You can keep one of these flags for Armed Forces Day, Independence Day and other official occasions when the flag is used, or fly it all the time right next to your American flag. Whenever you choose to display it, this POW/MIA flag will look great for the long term. Nylon flags are highly durable and low maintenance. They maintain their color, are easy to clean and dry nicely. 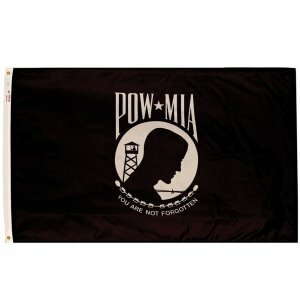 Thinking about the best way to hang your POW/MIA flag? Brass grommets facilitate a number of different hanging options. 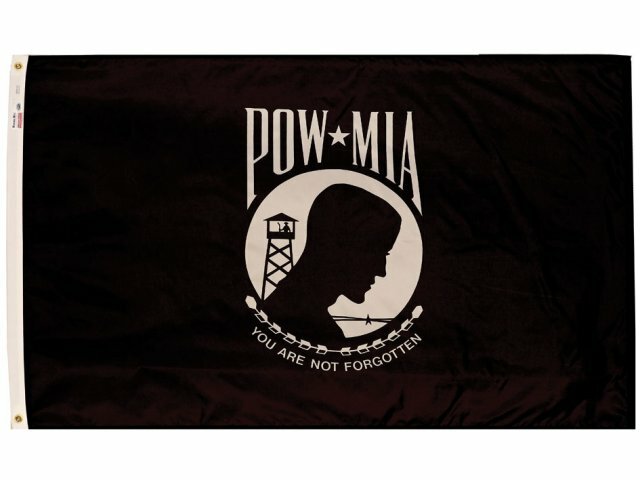 Support Our Troops: The POW/MIA flag demonstrates solidarity with those in the armed forces and their loved ones. Official Design: This flag has a double seal, so the emblem shows correctly on both sides.